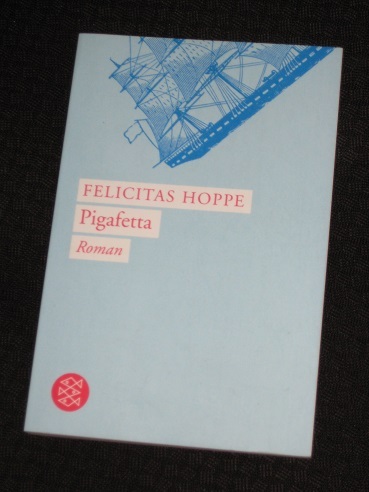 Felicitas Hoppe’s Piggafetta is a rather strange book in which an unnamed female protagonist travels around the world by sea. Forget any ideas you might have of a luxury cruise, however; the ship in question is designed for cargo, and the narrator is one of a handful of passengers who are more tolerated than welcomed by the crew. Embarking in Hamburg, we cross the Atlantic, with brief stops on the US coast, before cruising through the Panama Canal en route to Sydney. Our journey then takes us northwards once more, with a trip through the Suez Canal awaiting us before our return to Germany. In truth, though, the cities and countries visited are irrelevant, as this is a story of the sea. The bulk of the novel is spent in transit as the narrator tries to pass the time on a vessel that’s not really equipped for a leisurely transit. As we power through the waves, crossing the equator twice and risking the wrath of King Neptune, one question frequently emerges: what exactly is the woman seeking from the voyage, and what on earth are we doing here? Da hob der Klempner plötzlich den Kopf, schlug mit der flachen Hand auf den Tisch und schrie die schöne und einfache Predigt der Klempner gegen das Heimweh und die Seekrankheit im Auge des Sturms: TRAVAILLEZ ET MANGEZ! At this point, the plumber suddenly raised his head, slapped his hand flat on the table and bellowed the beautiful and simple plumber’s sermon against home- and sea-sickness in the eye of the storm: TRAVAILLEZ ET MANGEZ! However, the trip is not all there is to Pigafetta. The book is divided into nine sections, and at the start of each part, there is a brief piece, usually two or three pages in length, in which the writer/narrator talks about a story, her family and the captain of a ship. All of this pushes us into seeing the main action with rather different eyes, perhaps as a story told by the narrator of these short pieces. Hoppe wrote the novel after taking a similar trip (I’m not sure if it was on a similar ship…), and there’s a definite sense of fiction and reality bleeding into each other, with the dividing line between the story and narrator difficult to discern. You could almost imagine her as a modern Jason, falling asleep in the shade of the tired ship and being crushed by a falling section of railing. Still, it was a pleasant journey, and there’s enough there in Hoppe’s writing to suggest that I’ll try more of her books in the future – which is not something many of my readers will be able to do. You see, as far as I can tell, virtually none of her work has made it into English so far (all I’ve found is a set of five short stories, Picnic of the Virtues, translated by Katy Derbyshire for Readux Books…). Whatever my views on this particular book, when you consider her output in German, and the list of prizes she’s been awarded (including the prestigious Georg-Büchner-Preis in 2012), that’s a disappointing discovery. Let’s hope this oversight is remedied before too long so that you can make your own minds up as to who, or what, Pigafetta is all about.